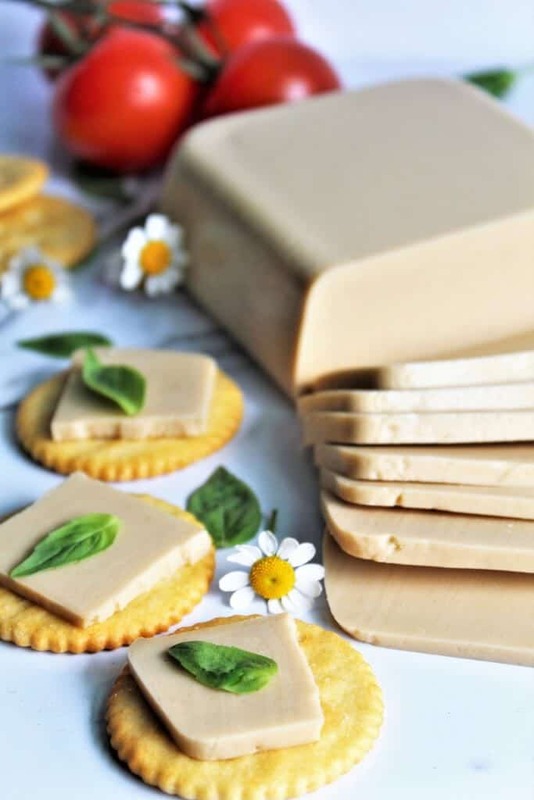 Vegan Smoked Gouda made with coconut milk may be the all-time best dairy-free cheese! It has a rich creamy texture with a subtle smoky flavor. This is a cheese that you just have to try to believe how good it really is. 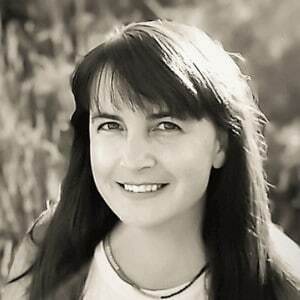 Coconut Milk: There are many different methods of making vegan cheeses, but I have found the richest and creamiest vegan cheese is made from a can of full-fat coconut milk. You could use other plant-based milk instead or even cashew cream, but I find that the coconut milk gives it the rich creamy texture that I crave in cheese. Nutritional Yeast: To give it the cheesy flavor. Liquid Smoke: For that smokey goodness of smoked Gouda. Agar-agar: A vegan gelatin to make the cheese firm. (This is absolutely necessary and can not be substituted). Agar agar is a white powder made from seaweed. It’s essentially a vegan gelatin. (It comes in flakes or powder but use the powder. It is less expensive, you need less of it, and it blends easier and smoother than the flakes). You can find great prices on it at most Asian markets or you can buy it on Amazon as well. How do you make the vegan smoked Gouda? To make this smoked Gouda, you will need to cook the cheese in a pan on the stove top. Pour all the ingredients into a saucepan. Bring to a slow boil while stirring constantly for 6 minutes allowing the agar agar to melt completely and get very smooth. Pour the cheese into an oiled glass container and let it sit uncovered for about 15 minutes until it cools slightly, then put the cheese into the refrigerator to cool for at least 2 hours. It will set up firm and be able to be sliced or shredded. If you are making the melting style vegan cheese, it will set up softer than the variety with less tapioca starch. 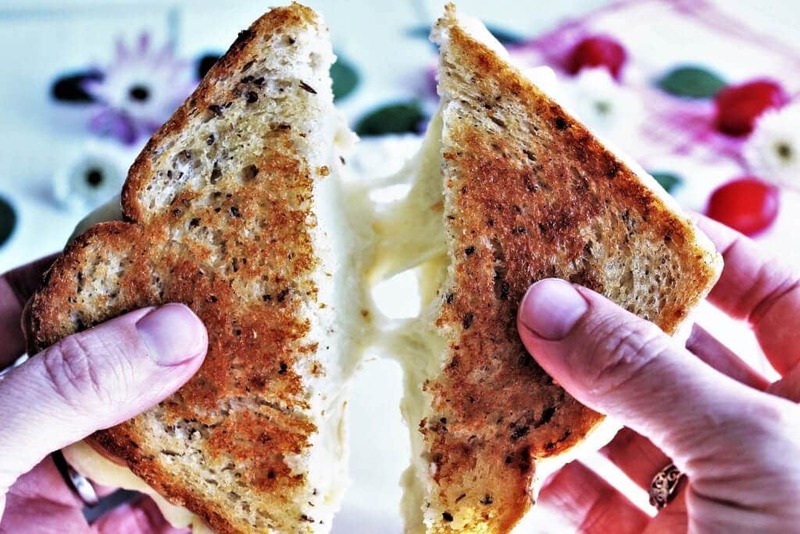 Make this vegan smoked Gouda into a smoked Gouda grilled cheese! Delicious with caramelized onions too! Can’t get enough garlic and herbs? Check out my vegan cheese with garlic and herbs! Looking for a classic vegan provolone recipe? Learn how to make vegan cheese – provolone style. Want a sharp vegan cheddar? Try my homemade vegan cheddar cheese recipe. Did you make this cheese? Leave a comment and let me know how it went! 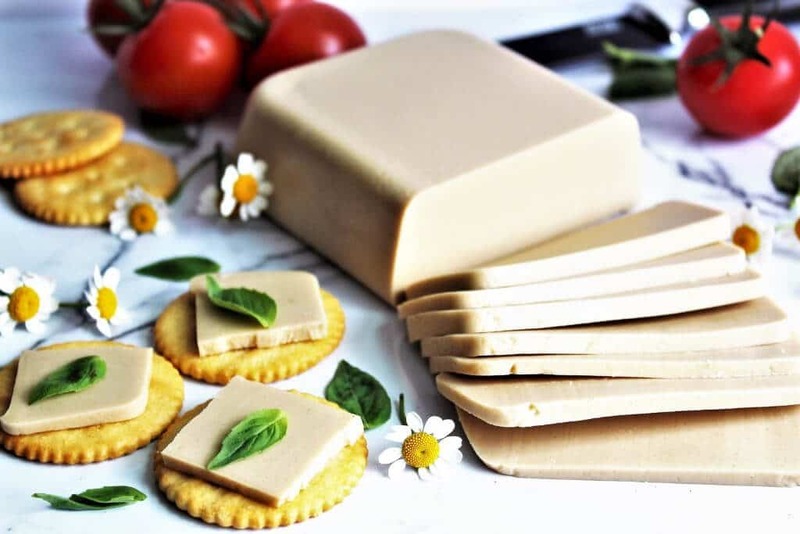 Vegan smoked gouda cheese made with coconut milk. Free of gluten, dairy, soy, and nuts! Once the cheese is cooled completely cover and store in the refrigerator in a sealed for up to a week. For a smoker cheese, add an additional tbsp of liquid smoke. Delicious on pizza or grilled cheese especially with caramelized onions! Is it possible to actually smoke this and the other cheeses traditionally ? Would another starch work instead of tapioca? Sorry, no other starch works to make it melt and stretch as well as the tapioca does. You can just leave it out for a firmer sliceable cheese. Hi, I want to know before doing that’s recipe, -that by the way looks delicious- without salt. Only the salt that have the nutritional yeast. I’m trying doing good with low or no salt at all. But I don’t want to mess not the flavor but the texture. I can deal with the no salt flavor… thanks for great recipe!!! I just made this recipe and the taste is absolutely delicious, however the texture is a bit on the gelatinous side- should I be putting less Agar or maybe putting in no tapioca starch at all? Hi. I was wondering if tapioca starch would work well instead of the agar agar? Not sure if I missed it in the comments but I’m wondering if this freezes well? Monica, I just finished making your smoked gouda for the first time and it is so rich and delicious! I completely forgot it was made with full-fat coconut milk because like you said, you can’t taste it at all! I didn’t realize I was so short on liquid smoke, so when I went to measure it, I had exactly one tablespoon left. I didn’t want to wait another day, so I used a tablespoon of Bakon powdered hickory smoked seasoning. I was concerned about adding the powder, thinking it would clump up, so I poured the whole recipe into my Bullet and ran it just to mix everything up then poured it in the pan to cook. It turned out beautifully. I had a little leftover after pouring it into my mold and poured it into a little cup. I just checked on it and it firmed up really well! I am really pleased with this recipe and I’m happy I found a good vegan cheese with no nuts. I’m not allergic to nuts, but it’s good to have variety. Thanks so much! I’ve gone through your website, but I haven’t found your cheddar cheese recipe. is it in the making? I love cheddar! Thanks! Can’t wait for that cheddar! Just made this this morning, licked the spoon and saucepan and now really not sure how I’m going to be able to wait until it’s set! Already delicious! Looks amazing! Do you think I can substitute the liquid smoke for smoked paprika? Do you think this would work ok with smoked paprika instead of liquid smoke? I know it’s not quite the same but I don’t use liquid smoke. Thanks ? Made this yesterday. So good! I only had mesquite flavored liquid smoke, but it still tastes amazing. Yummy as a grilled cheese (will have to add the carmalized onions next time) and with spicy mustard on crackers. Thanks for the recipe! Since becoming vegan, smoked Gouda is the one cheese I miss the most! And I usually have all these ingredients at home. Only had to purchase the agar agar powder! de ton inspiration !!! J’ai hâte à la la prochaine découverte gastronomique avec une autre recette exceptionnelle!!! OMG! This was amazing! I made the kind for just slicing. I had to stop myself from eating the whole block of cheese myself! My new favorite vegan cheese! Thanks for this recipe! It was really fantastic. I used 2 teaspoons of smoke instead of 2 tablespoons, 2T nooch, and 2T tapioca starch. I also added a fourth teaspoon ground mustard. The taste was spot-on, but it didn’t melt well. Not sure what I did wrong. Hi Kate. I’m glad that you liked the flavor! I’m not sure why it didn’t melt for you. Make sure to use 2 tablespoons plus 1 teaspoon of tapioca starch. That is what makes it stretchy and helps it melt easier. Also, make sure that the cheese is warm enough to melt. When using it in a grilled cheese or quesadilla, make sure to heat it slowly so the middle gets warm enough to melt or stick it in the microwave for about 20 seconds to get the temperature up. It has to reach a high enough temperature to melt. (slightly higher than cows cheese). I hope that helps! Thanks for your recommendations! Do you think it works better if you shred it? I cut mine into thin slabs, but now I’m thinking it would have been better to shred it. Is it possible to substitute the coconut milk with an avocado and some nut milk instead? I have never done that before, but it’s a good idea! I think that it would work. I would puree the avocado with the plant milk first before adding it to the pan. Just make sure the total volume of the avocado/milk mixture equals 17.5 ounces. (That would be 2 cups + 1 1/2 tbsp.) (That is the volume of the liquid in the recipe). Let me know how it turns out! OMG! 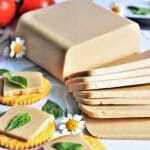 Just made this – The BEST vegan cheese that I have ever had!!! Thanks you so much for the recipe! You’re welcome! I’m so glad you made it and love it too!